How to make Image Slider widget autoplay the images? My images are not sliding using the Image Slider widget. The only way to see the images is to manually click the right/left arrows. 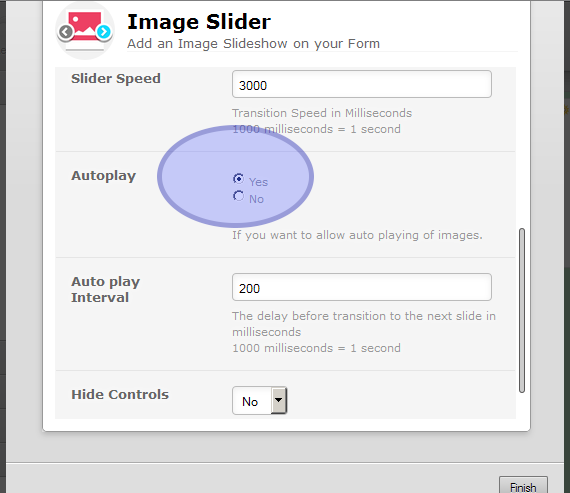 I do not want that option, rather to have the images slide automatically. I took a look at your form and I noticed 2 issues. First was that the images were loaded over HTTP (insecure) while the form was loaded over HTTPS (secure) protocol. Because of that some people might not have seen the images. Now the second thing is that the autoplay was turned off, which you can turn on in the wizard of the Image slider widget. I have already applied that to your form so that you can check it out yourself, but do let us know if you have any additional questions and we would be happy to assist with the same. Thank you. I did not see that you can scroll down in the wizard to view more settings. Yes, it is using invisible scrollbar so that the styles are not affected by the same.